Chop onions and set aside. Peel the garlic and put it into a mortar. Add some salt and then pound into a pulp. Cut the beef into small cubes. Peel potatoes. In a non-stick pot, add the oil and when this is warm, add the onions and cubed beef. After briefly frying the beef, add a bit of water and attend to the other preparations. Heat the cumin seeds and cardamon in a pan before putting them into the grinder. When the spices are ground, separate the husks where necessary. Mix the finely ground cumin, cardamon, cloves, garam masala and black pepper together before adding it to the frying beef. Sprinkle in your stock. Stir and add enough water for the amount of rice. Add the potatoes. Stir so that it is all mixed well, before covering. Cook on medium heat for ± 20 minutes. Check once or twice and turn your wooden spoon through the rice once. Stirring more will make the rice mushy. 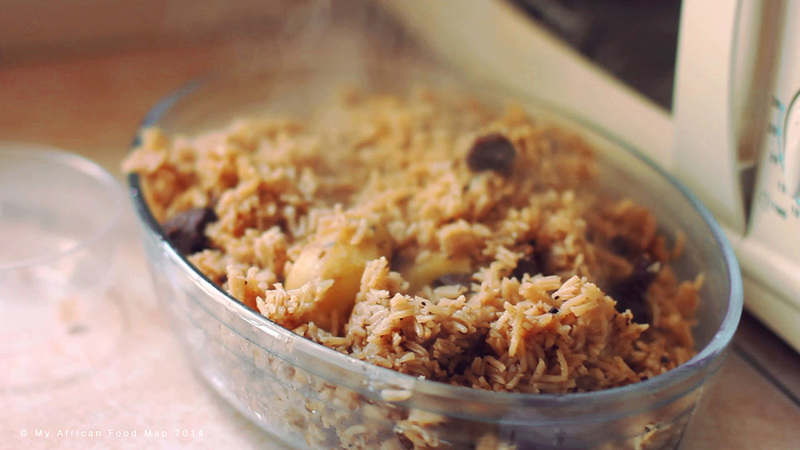 Once the rice is cooked, the meal is ready to serve. A chef, entrepreneur and mother. She is absolutely passionate about cooking and it was a real pleasure for me to have met her. She would be happy to hear from you if you have any questions about the food she has prepared for this and all our Kenya videos, or if you are in Nairobi and are interested in her services. Recipe courtesy of Miss Diana. “We put cumin seeds, we put cardamom , we put black pepper, and cloves. We also put garam masala, we put beef stock, and we put…, what else? I think basically that’s what we put. Most of the times actually, it comes out nicely. And it all depends on the type of rice that you use also, so that you’re able to get good results in terms of rice that is not attached; like that.